Free things to do in San Francisco in March include street fairs, festivals, and the monthly museum admission days. Other highlights include a visit to some of our free attractions and museums. The biggest event this month is the annual Saint Patrick's Day Festival and Parade. You can also head out on walking tours, enjoy some of our colorful murals, and learn more about SF and the Bay Area at our museums. 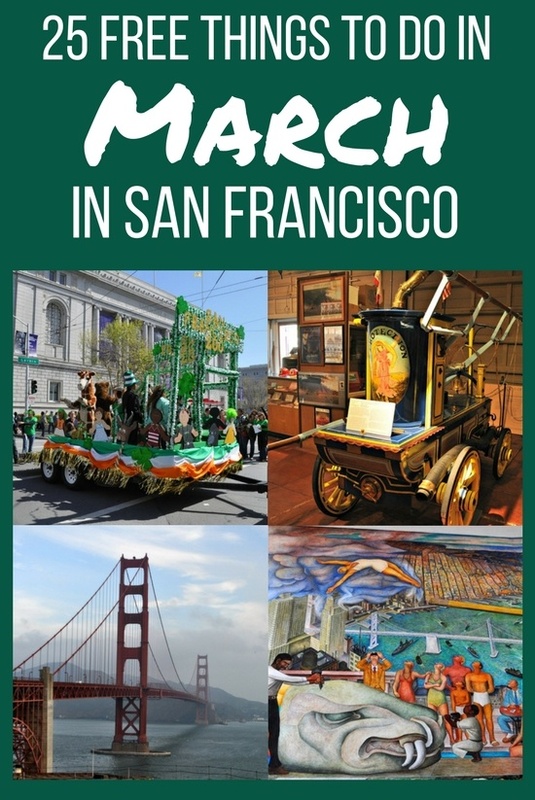 One of the biggest, most popular free things to do in San Francisco in March is the St. Paddy's Day Festival and Parade. The actual holiday is March 17, but the large street festival takes place either the Saturday prior or the Saturday after the holiday, in downtown SF. That morning, streets will be closed to welcome bands, bagpipes, floats, and many other entries all decked out in green. The Irish music, dancing, drinking, and entertainment will continue at the Civic Center Plaza until about 5pm that afternoon. San Francisco contains so many world-class museums of science, art, and culture, it can be difficult to choose just a few to fit your travel budget. That is why you should take advantage of the free admission days that many of SF's top museums offer. This March, you can get access to the Asian Art Museum, the Conservatory of Flowers, the de Young, Legion of Honor, Museum of Craft & Design, and others--completely free on designated days. The Exploratorium is giving out free admission to honor Pi Day (3.14), and you can click the link below to get exact dates for the other museums. The walking tours led by incredibly knowledgeable SF City Guides, part of the public library, are always one of my favorite free things to do in San Francisco in March. 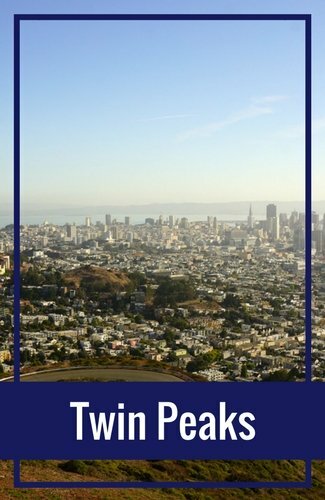 These tours give you an in-depth look at some of the most popular neighborhoods, like Chinatown, North Beach, and Fisherman's Wharf, as well as some hidden gems of the lesser known areas, like the Russian Hill stairways and the Pacific Heights mansions. With some designed especially for history, architecture, art, and nature lovers, you can cover just about any aspect of the city with these fascinating free walking tours offered daily. While many folks come to Coit Tower to admire the 360-degree views from its observation deck, you can visit the historic building for free and just take a look at the colorful, controversial murals painted all over the first floor. The murals, which were painted in the 1930s, depict stories about California life during that era and were inspired by Mexican artist Diego Rivera. The walk to get here is in itself a fun little adventure, as you'll come face-to-face with the famed wild parrots that live on Telegraph Hill (upon which the museum sits). Every day, thousands of tourists pass by Fort Point National Historic Site without even realizing it. 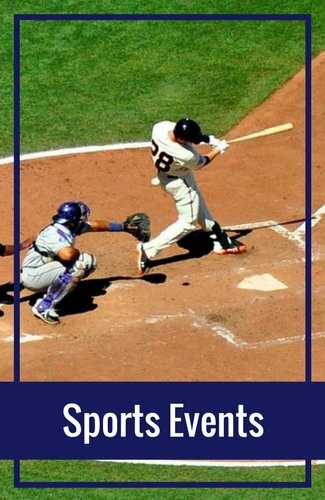 That's because it sits just beneath the southern end of the Golden Gate Bridge in the Presidio. However, if you like history, especially military history, this is a free SF attraction that you should not miss! 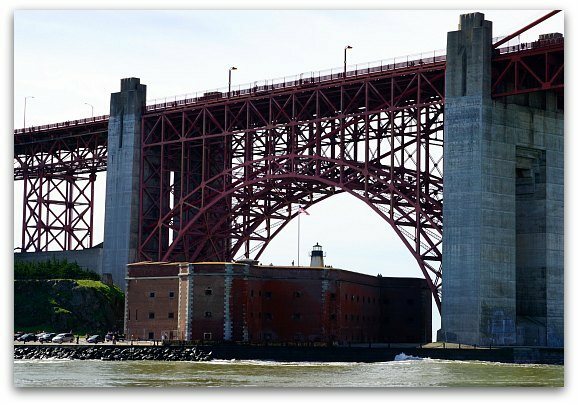 The building dates back to 1861, when it was used as a fort to protect the city, and in the 1930s it was almost destroyed to make way for the Golden Gate Bridge. Head over here for a tour of the grounds, videos of its history, cannon demonstrations, and even candlelit tours at night. 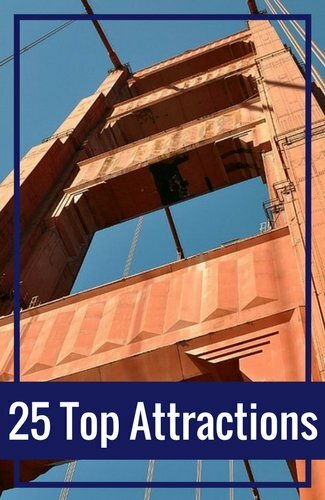 One of the most classic free things to do in San Francisco in March is to visit the iconic Golden Gate Bridge. When it was completed in 1937, it was truly a architectural feat, as it was the longest suspension bridge in the world--not to mention its bright orange towers rose 65 stories above the water. There are many ways to view this masterpiece up close, but the best (and free!) way is by walking the 1.7 miles across it from one lookout point to the other. This gorgeous French gothic cathedral is impossible to miss while you're in the Nob Hill area, as it is the third largest Episcopalian church in the nation. It's twin stone bell towers rise high into the sky flanking the golden Gates of Paradise at the entrance. The inside is just as spectacular, boasting an AIDS Memorial Chapel, colorful murals, and even a labyrinth inlaid in the floor, upon which you'll find a free yoga class every Tuesday night at 6:15pm. Lombard Street is another one of those classic San Francisco postcard images, and it's a fun and easy attraction to visit for free. The one-block brick-lined segment of Lombard between Hyde and Leavenworth is famously crooked, and turns eight times so that cars can make it down the steep grade (it's a one-way street, of course). You can walk down either side admiring the beautiful gardens that sit in between the curves in the road, and then snap your photo at the bottom. 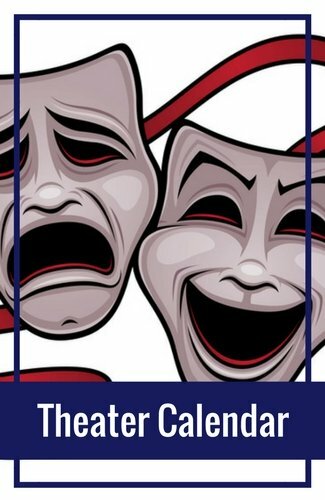 Find great discounts on tickets for tour and events on Goldstar. You will find tickets at up to 50% off theater shows, cruises, and more. 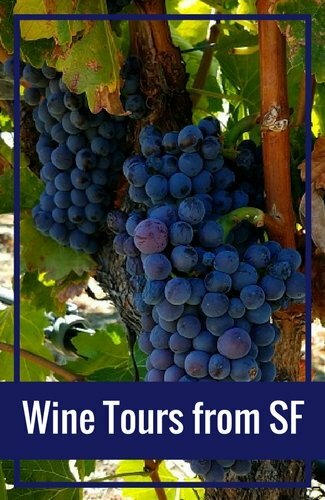 Click the links below for some of the most popular tours and to find additional savings on their site. Another one of my favorite free things to do in San Francisco in March is explore the streets of the Mission District while taking in all of its colorful murals. They are easy to spot and you'll find them on the sides of buildings, garages, alleyways, sidewalks, and more. Some are painted with brilliant colors, others incorporate mosaics, and yet others may surprise you with 3D elements. Many of the murals contain political and social messages, and all of them are captivating with their bold colors and designs. The ornate, classical architectural style of the Palace of Fine Arts makes this site a popular place for movie scenes and wedding photos, but it also makes a gorgeous setting for a perfect afternoon stroll or picnic. This attraction is located in the Marina District, and is the only remaining structure from the 1915 Panama Pacific Exposition. The gorgeous rotunda and Roman columns are surrounded by a peaceful lake, a scene that was simply too beautiful to destroy when the rest of the fair was taken down. The SF Fire Department Museum is run by volunteers and sits adjacent to one of the city's active fire houses in the Pacific Heights neighborhood. 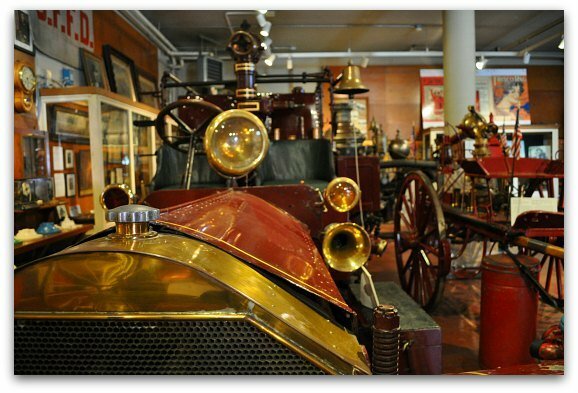 It is one of the largest collections of fire fighting memorabilia on the west coast, including antique fire trucks and hoses from the early 1800s and stories and photos of San Francisco after the devastating earthquake and fire of 1906. 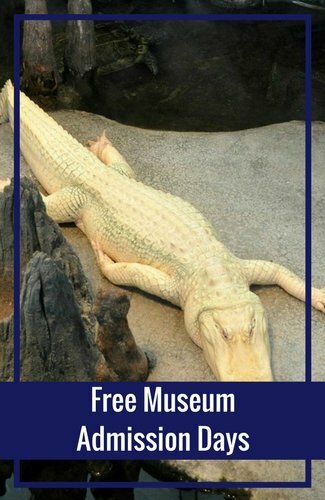 This is a great free attraction for history buffs. Just make sure to call and confirm their hours before you arrive. If you're interested in learning about the art, culture, and heritage of Italy and Italian Americans, make a trip to the Museo Italo Americano at the Fort Mason Center in the Marina District. The museum was originally housed in SF's "Little Italy," also known as North Beach, but it has since expanded to include larger galleries of paintings, sculptures, and other interesting pieces. This museum also serves as a cultural center where you can take Italian language lessons and attend lectures, concerts, film series, and food events. The Mexican Museum is another cultural museum that is located at the Fort Mason Center, as its original location in the Latino Mission District became too small for it. It's the only museum in SF that is affiliated with the Smithsonian Institute in D.C., making the quality, depth, and variety of their exhibits unbeatable. Enjoy special visiting exhibits as well as the spectacular permanent collections of pre-historic (Mayan and Aztec), colonial, Mexican/Latino, and Mexican-American/Chicano contemporary art. All of this, completely free! For visitors traveling with children, one of the best free things to do in San Francisco in March is to take the family to the hands-on Randall Museum. This museum features a live animal exhibit, a greenhouse and gardens, a science lab, a woodshop, an art and ceramics studio, and a toddler playroom, all designed to encourage children to be creative and appreciate the world around us. Have you ever wondered about the history of Wells Fargo Bank? Like how it got its name and stagecoach logo, or where it was founded? The bank dates back to the earliest days of California. Located in SF's Financial District, the Wells Fargo History Museum takes up two stories and is full of interactive exhibits, rare old photographs and documents, and interesting displays about the Gold Rush and other monumental moments in San Francisco history. The Golden Gate Fortune Cookie Company is a fun, free stop to hit while you're wandering the streets of Chinatown. The factory is small but worth a visit, as you'll get a unique inside look at how these little treats are made--and you might even get offered one hot off the press! The fortune cookie was actually a Chinese-American invention that did not originate from China itself, but the making of them has been a San Francisco tradition for well over half a century. 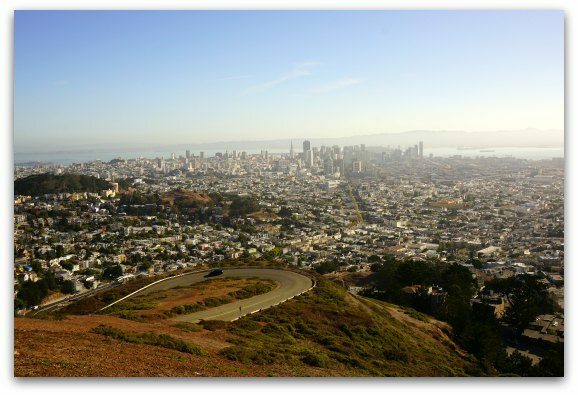 At 922 feet above sea level, Twin Peaks is the second highest point in San Francisco and offers amazing views of the whole bay. You can drive or take a tour bus up to the north peak parking lot to take in the views, but it's also fun to hike up and around the peaks, as they are known for their animal and plant diversity. The park actually encompasses acres of coastal scrub and grassland that are home to the endangered Mission Blue Butterfly and many species of birds, rabbits, and coyotes. Another one of the outdoor free things to do in San Francisco in March is to enjoy the urban works of art that are the unique staircases spread throughout the city. You'll find two sets of lovely mosaic stairs in the Inner Sunset District, and another in the Inner Richmond. These flights are covered with beautiful patterns of colorful tiles that come together to form pictures of the sea and gardens. In addition to the mosaics, you'll find a set of steep, foresty stairs on Telegraph Hill, a fun sand ladder leading down to Baker Beach, and another set of beautifully landscaped steps in Pacific Heights. You may know of Diego Rivera as the husband of famous painter Frida Kahlo, or as a famous (and controversial) artist himself. But did you know that this Mexican muralist created three huge frescos in San Francisco, one of which was the first work he completed in the US? They all depict historical figures and everyday people and laborers of his time, and they are considered controversial because of his affiliation with the Mexican Communist Party. His three SF works are entitled "Allegory of California," "The Making of a Fresco Showing the Building of a City," and "Pan American Unity." You may have heard about the stunning spring cherry blossoms that are such a big part of the Japanese culture. Well, the Japanese Tea Garden in Golden Gate Park is like a little taste of Japan in the US, and taking a stroll among the gorgeous blossoms is one of the most blissful free things to do in San Francisco in March. Now through April is when you'll catch these traditional plants in full bloom. At the gardens, you'll also enjoy the five-story pagoda, the high arching drum bridge, the zen rock garden, and the teahouse. Alamo Square is a popular tourist destination for its postcard-perfect views of SF's famous Victorian homes overlooking the city skyline from a hill. Across from the inviting grassy park, you'll see the famous Seven Sisters sitting proudly in a row. These seven houses belong to a category of Victorian architecture called the "Painted Ladies," due to their combination of pastel colors and ornately detailed windows, towers, stairs, and trims. You'll find these beauties scattered throughout this cute, friendly neighborhood. With all of the haggling, eating, and shuffling you'll encounter in busy Chinatown, it's easy to miss the peaceful temples that sit amidst all the hustle and bustle. 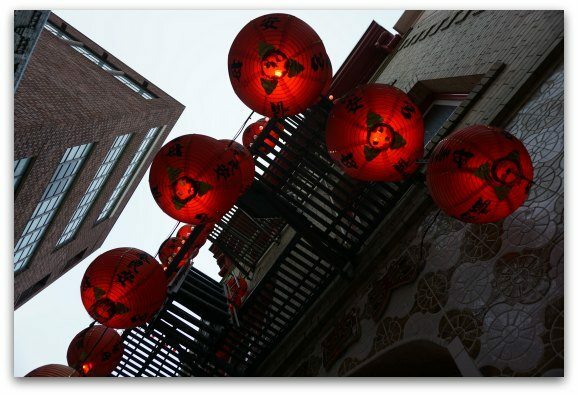 In the link below, I introduce you to my three favorite Buddhist and Daoist centers of worship in this SF district: the Kong Chow, Tin How, and Ma Tsu Temples. They are all free to enter and full of statues, red and gold decorations, flowers, fruit, and lanterns to admire. Just be respectful by not touching the altars or talking loudly as you visit these powerful places in the community. For many SF tourists, the shiny cable cars are a beloved novelty that they must ride at least once up and down San Francisco's famous hills. But if you're especially enamored by these little beauties, beyond riding them, it's worth checking out the free museum dedicated to their history. Here you'll not only find real antique cars, photos and other historic paraphernalia, but also the live cables that currently keep all four lines running and the barn where the cars are kept at night. San Francisco's City Hall is a very large, stately looking building that you can visit for free. From the outside, you can admire its many columns and towering gold-trimmed dome (the tallest in the country, surpassing even the US Capitol building). From the inside, you can admire the ornate designs carved into the dome, ceiling, and walls, as well as the impressive marble staircase that flows into the rotunda. If you venture upstairs, you'll also find the history and monuments of Harvey Milk and Mayor Moscone, who were assassinated here in the 1970s, thereby becoming martyrs for the gay community. Among the many free things to do in San Francisco in March, you can also visit the observation tower at the de Young Fine Arts Museum in Golden Gate Park. While it costs money to get into the art exhibits, riding the elevator up to the observation deck is free of charge and well worth the visit. From this 9th floor lookout, you'll get 360-degree views of the surrounding park, and even the top of the Golden Gate Bridge and part of downtown. 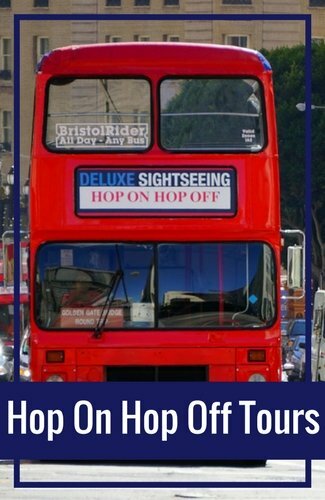 One of the best ways to see all of these free things to do in San Francisco in March is by taking a hop on hop off bus tour. These open top buses will take you all around SF and easily get you from one attraction to the next. Many of them offer more than a dozen stops per route. They go through Fisherman's Wharf, Union Square, the Golden Gate Bridge, and Golden Gate Park.